Thanks to my inability to pass a whole food shop without buying something, our kitchen cupboards are heaving. The other day a packet of raw buckwheat groats fell out on top of me and their message was clear. Now you've bought buckwheat flour you are leaving us out! We're great too... Sigh. #leftout. 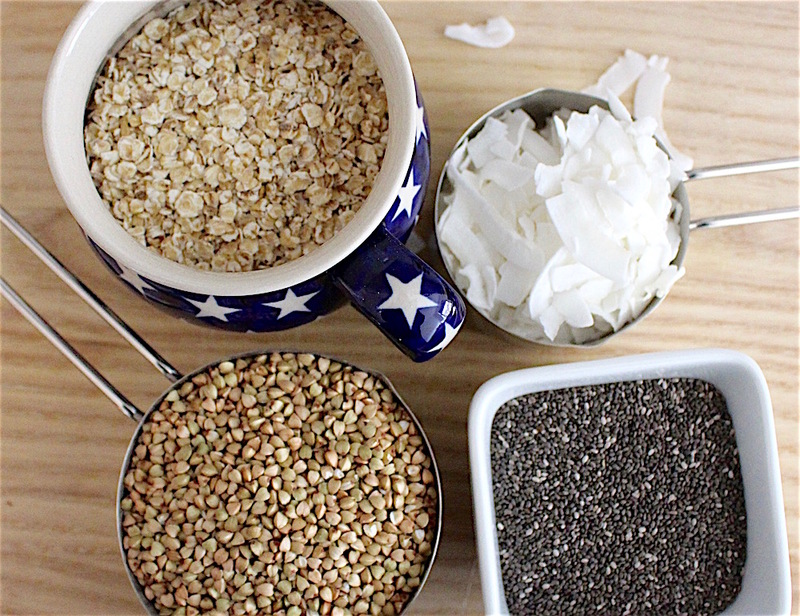 Feeling a bit guilty - and weirded out that the buckwheat was talking to me - I decided to use up some of the half-empty packets. 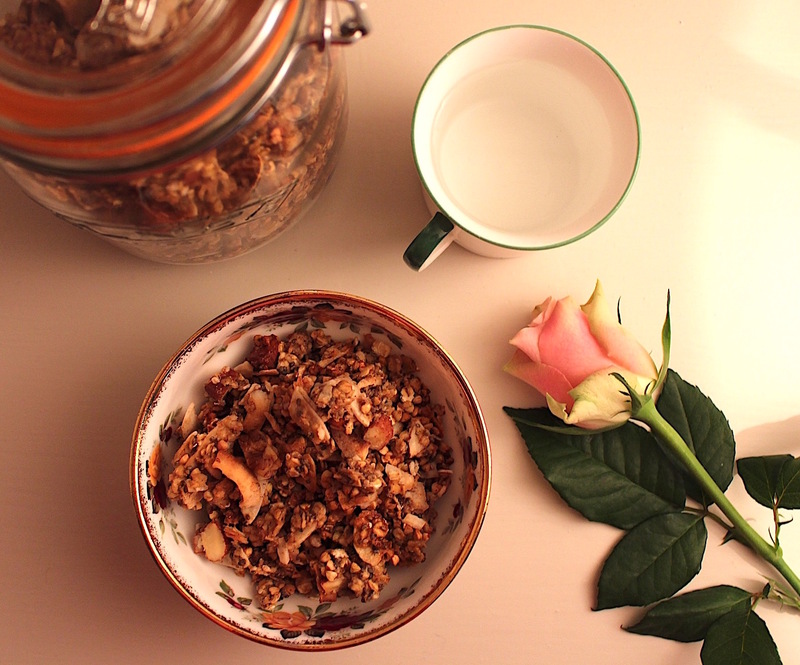 I've been wanting to try a homemade granola for a while now, so this seemed like the perfect chance. 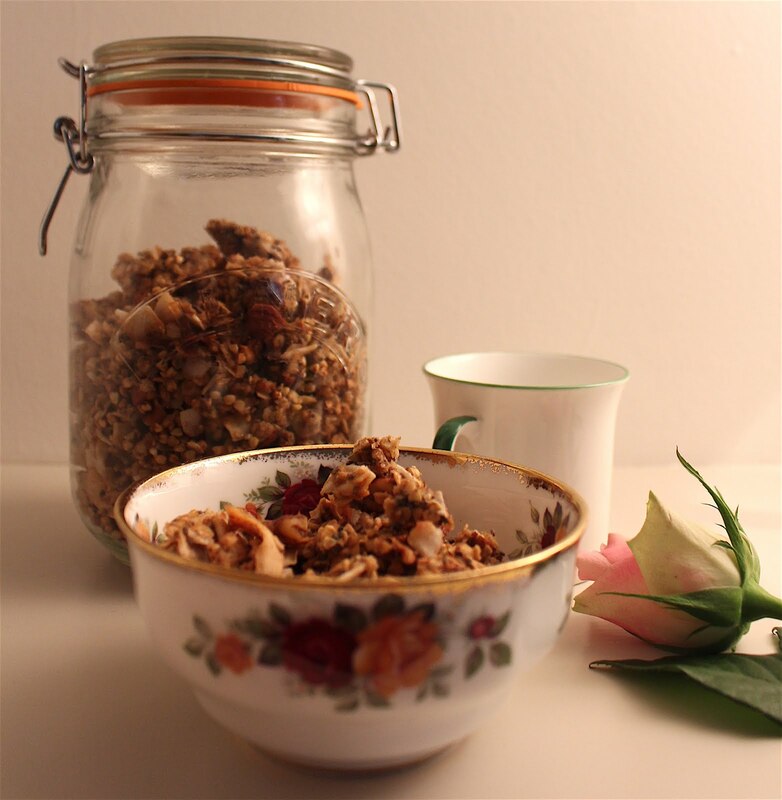 Using the Hemsley's Buckwheat Crunch and My New Roots' Banana Bread Granola for inspo, I came up with this Buckwheat and Coconut Granola. 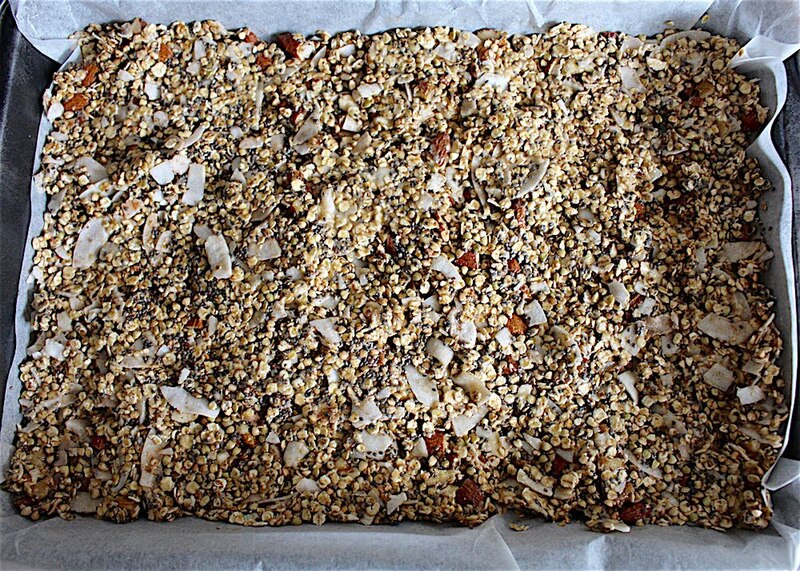 Lightly flavoured with banana, absolutely packed with tasty nuts and seeds, and subtly sweet with maple and honey, this is such a ruddy winner at breakfast time. Also pretty good for mid-afternoon munchies straight from the jar. Preheat your oven to 160 fan. Pop your bananas, maple, honey and melted butter in a blender and whizz until smooth. Quick note: if the bananas aren't ripe enough (they need to be really nice and soft for this) then put them in the oven for 10 minutes. The skins will turn black and they'll be good to go. 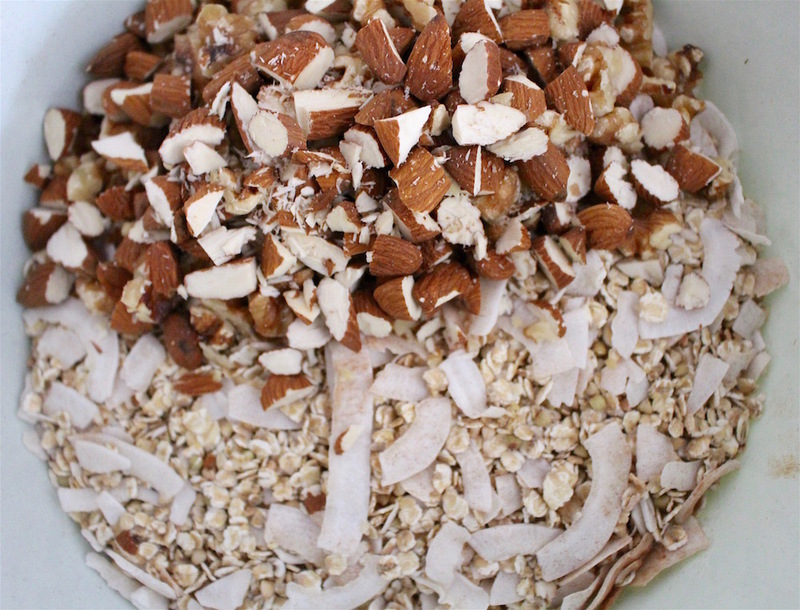 Combine the oats, coconut flakes, buckwheat, chia seeds, nuts, cinnamon and ginger in a bowl. Pour the banana mix on top and give everything a good stir, making sure all of the dry ingredients get a little bit of banana-y coating. Tip into a baking tray lined with parchment and pat down to give a nice, tight mix. Bake for around 30 minutes. Keep an eye on things because timings will depend on how thick you mix is / the size of your baking tray. It's ready to come out when things are starting to look nice and golden. Use a spatula to flip the mixture over in the tray. It will naturally break into large chunks as you go. Put it back in the oven for 10 more minutes. Repeat the process again, flipping the mix over. Each time you do this, the chunks will get smaller. Pop back in for another 10 minutes. Take your tray out and have a look at the mixture. Is everything going brown and looking kinda crunchy? Then you're all done! Leave everything to cool in the tray before breaking any big bits up and spooning into an airtight container. 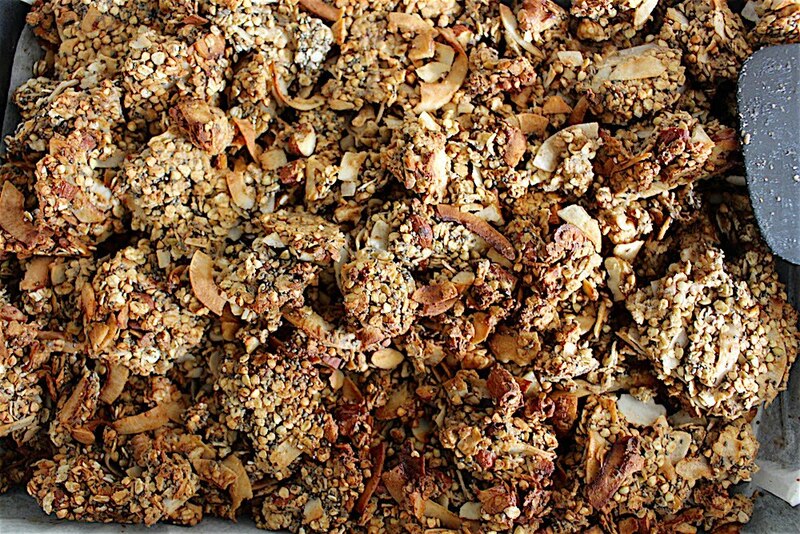 The granola will keep for a month like this. To serve, pour on some cool milk or spoon the granola over greek yoghurt, top with berries or more seeds and demolish. Happy breakfasting!